Jurassic Park re-release: Scientists snort at the dinosaur excavation scene. It’s not the “bringing dinosaurs back to life” bit that makes paleontologists snort. 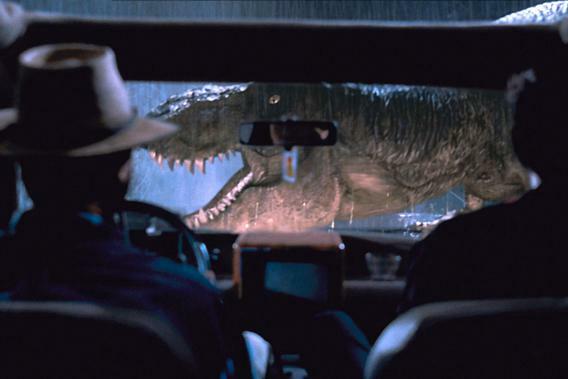 Jurassic Park is the greatest dinosaur movie ever made. I’m ecstatic that the classic film is briefly back in theaters to celebrate its 20th anniversary. That doesn’t mean the big screen adaptation of Michael Crichton’s “Don’t Mess with Nature” fable is free from scientific howlers, though. The twin-crested Dilophosaurus didn’t really have a garish neck umbrella or spit poison, and Alan Grant’s unsupported belief that Tyrannosaurus had vision “based on movement” should have increased the movie’s body count much earlier in the story. (Even if we concede that old T. rex was virtually blind, that doesn’t explain why our favorite Mesozoic monster could not smell its victims when it nearly snorts Grant and young park visitor Lex up its nostrils.) And don’t even get me started on the lack of fuzz and feathers on the dinosaurs. But whenever I watch the movie with paleontologists—which is really the best way to do it—most of their bemused laughter comes early in the film. In the most outrageous scene in the story, a field crew quickly brushes sand off a Deinonychus skeleton as if the dinosaur were a dusty curio. I wish that digging dinosaurs were as easy as Jurassic Park made it look. I really do. The “raptor” fossil—called Velociraptor in the film, but really a Deinonychus to paleo pedants such as myself—that Grant and Sattler’s team exposes is buried under the thinnest coating of sand. And the complete, articulated skeleton is so sturdy that one of the field assistants can stick his grubby hands right into the dinosaur’s nasal cavity and flick out the sand. Watch the scene carefully. It’s the only time I know of that someone picking a dinosaur’s nose has ever been shown in a feature film. In a real field camp, whoever had the bright idea to jam his paws into a dinosaur skull and start rooting around would be stopped with a scream of four-letter invective. How paleontologists and field volunteers actually find dinosaurs, from spotting the first scrap of bone to making a dinosaur skeleton nice and pretty, is an intensely difficult and wonderfully rewarding process that deserves its own cinematic treatment, complete with a dramatic orchestral score. And since paleo fieldwork is relatively cheap, “Spared no expense!” would simply mean making sure there was plenty of plaster and sunscreen for the day shoots and a full array of beer and whiskey back at camp. Let’s say you want to find a Tyrannosaurus, Stegosaurus, or even some yet-unknown dinosaur. Paleontologists can’t just crank up a machine and get a map of where the best skeletons rest, despite the sonic technology seen in Jurassic Park. Paleontologists have actually used sonic setups in the past—pinging sound waves that get picked up by microphones to detect changes in rock density. But it’s inefficient and is useful really only when you know you’ve already got a skeleton in the ground, and even then it doesn’t send back the kind of immaculate X-ray imagery seen in the film. Finding dinosaurs requires squads of field workers to scour as much ground as possible, then pick and shovel their way through stone. Really, the way paleontologists find dinosaurs today is the same way bone sharps did during the 19th century. During all the hiking and occasional fossil tasting, dinosaur hunters are looking for trails of bone shards leading into a layer of rock. Bones rarely appear intact on the surface. If they do, they’re probably just days or weeks away from crumbling into pieces. I’ve seen plenty of these exploded bones in Utah’s Grand Staircase-Escalante National Monument—piles of tan and chocolate-shaded fragments that constituted a bone for 75 million years until being eroded away from the rock and totally falling apart within the last few months. They’re so far gone that it’s almost impossible to tell what they originally were. Far better is to find a few such shards at the bottom of an exposure and to follow them up to where they emerged. With luck, those petrified crumbs lead the way to bones that are just starting to peek out of the rock but are still mostly safe within. Whether or not to remove the skeleton is a matter of triage. Field crews have a limited number of hands, constrained budgets, and only so many days of good weather to work in. Determining whether a dinosaur is worth digging out this season or next, or at all, depends on factors such as what the dinosaur might be, how complete it is, and how difficult an excavation is likely to be. Researchers might be willing to break their backs to saw out the rock containing what looks like a new species of armored dinosaur from a tricky overhang, whereas a scattered collection of damaged leg bones from an already-known shovel-beaked hadrosaur might not be worth even picking up. Fieldwork is done with shovels, picks, saws, chisels, and brushes, usually without exposing much of the bone. The goal is to trace the outline of a skeleton in its encasing rock and trim those blocks down as small as possible so that the crew can get them out. Most dinosaur bones are incredibly friable and fragile. Trying to chip one out with hammer and chisel would likely destroy the fossil and lead to you being banned from the field. (I know of one field volunteer nicknamed “Destructor” for this very reason.) The rock also protects the dinosaur during transport. You really don’t want a jumble of cleaned, fragile fossils bouncing around a truck bed while bumping over the road out of the badlands. The Jurassic Park crew made a boneheaded mistake by exposing so much of their fossil. They would have had to pile some sediment back on to create a barrier between the precious bones and the thick plaster jackets needed to get the fossils out. The delicate prep work—the effort that truly brings a dinosaur out of the rock—is done with dental tools and air-powered scribes back in the lab, where preparators can reveal bone bit by bit, keeping the fossils intact with consolidants and glues as they go along. Paleontologists usually aren’t even entirely sure of what species they’ve got or how much of the skeleton there is until the bones start coming out in the lab. Between collecting, preparing, and studying, it can take years for a dinosaur to materialize. Most dinosaur recovery work is obscured in scientific papers and museum displays. We emphasize the stories a dinosaur has to tell us about life, death, evolution, and extinction, but there are also tales of hard-won discovery, often driven by amateurs who were passionate enough to spend their vacation hiking through badlands or their weekends picking at rock in a lab. Skeletons carry lessons from the deep past, but they are also intertwined with private tales of long days spent shuffling over outcrop, fighting off gnats, shoveling a seemingly never-ending amount of rock, drinking around the campfire, gently freeing bone from rock, and trying to instill vitality to an animal that has been dead for millions upon millions of years. I think that’s why the paleontologists I know always chuckle hardest and a bit derisively during Jurassic Park’s camp scene. People who know dinosaurs, who have spent time among them and their geologic haunts, know just how elusive those vestiges of prehistoric life truly are.